Coolto Art Lodge i Medellin, Colombia : Boka nu! If you dont cancel the booking 24 hours before the arriving date, you will have to pay the total room rate. You will enjoy the localization Situated few minutes walking to Parque Lleras and Parque del Poblado full of night life, easy to get to main city attractions, center of the city and biggest shopping malls; we are right opposite to Exito supermarket, 100 meters away from multiple bus routes stations and 10 minutes taxi ride to the main south transport station “terminal del sur de transport”. 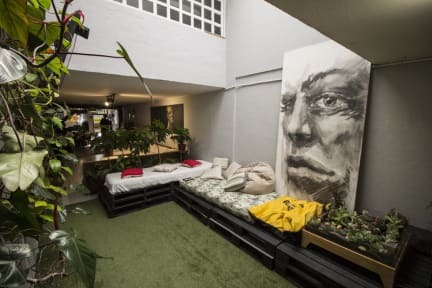 Full of taste decorated hostel, surrounded with amazing green areas such as a patio, Bar and chill out spaces. We will provide you the best info you can get to have an amazing city tours experiences, parties and wild nature immersion tours, almost all of it by walking distances. Coolto Art Lodge welcomes all the travelers in our private and public rooms, which are built to satisfy our guest’s necessities. We got a living room plenty of space with comfortable sofas, TV and PC, just aside a courtyard and the kitchen. Also, at the same time, enjoy good beers and beverages in our bar with a nice Balcony view. For the outsiders, we offer unique trekking walks to Natural Reserves and countryside views, also we got first hand info of best parties happening in Medellin for the experience to be amazing! 11:00 am: if you have not checked out, you will be charged for an additional night. Payment upon arrival by cash, credit cards and debit cards. -at you check out must deliver the key, bed linen and other elemental to be delivered to the reception. if not, you are charged for the absence theretofore. Think that this place was just not for me. Very loud hostel with cold showers and kind of a hangout place for groups of dudes. Not very clean at all, and I'm not picky. I only stayed for two nights but I have to say I won't be coming back. 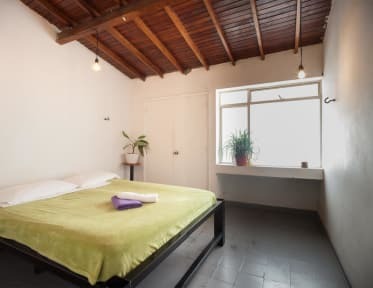 If you're not so concerned about your sleep and want to party instead then this place may be for you, since Poblado is full of tourists that wants to party.